Rebecca Deng, of South Sudan’s Dinka tribe, is one of the eighty-nine Lost Girls who came to the United States in 2000 as a refugee after living eight years in Kakuma Refugee Camp in northern Kenya. The violence she experienced as a child during the Second Sudanese Civil War (1983–2005) has given her a deep empathy for children and young adults who face similar situations today. She became a US citizen in 2006. Today Rebecca is an international speaker and advocate for women and children who have been traumatized and victimized by war. She has served as a Refugee Congress delegate at the United Nations High Commissioner for Refugees (UNHCR) in Washington, D.C. She also led a sixty-five person team of referendum workers at the 2011 Out of the Country Voting Center for the South Sudanese Independence Referendum. She currently works with the American Bible Society’s Mission Trauma Healing program, formerly called She’s My Sister. Rebecca speaks Dinka and English, and understands Swahili, and Arabic. 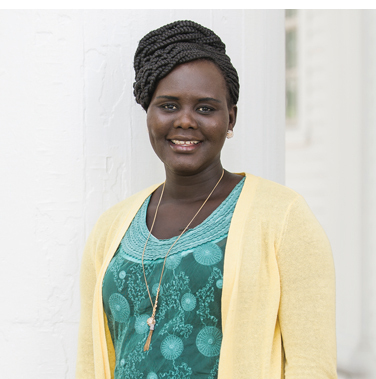 She has a bachelor’s in international development from Calvin College and a master’s in ministry leadership from Grand Rapids Theological Seminary. She studied in Thailand with International Sustainable Development Studies Institute (ISDSI) and volunteered in a refugee camp for Burmese families, after which she got her foster family’s neighborhood involved in a project to sponsor hill-tribes-minorities refugees from that area. She is married to Jordan Roeda and has three children, Cholie, Deng Jakob, and Leona. She resides with her family in Holland, Michigan. She loves traveling, hiking, good conversation, and international cuisine.